Why do I feel so frustrated about the new world of identity politics? I suppose because it is politics based on partial blindness, rather than understanding the whole picture. Because it accepts no progress except complete victory. Most of all, because everybody has to be one thing or another. This is something I have discovered the hard way by writing recently about two people who were clearly bisexual. Earlier in the year, my book about the criminalisation of homosexuality came out, and the narrative interwove the rather tragic story of my great-great-grandfather, who got caught up in the Dublin Scandals of 1884 (the book is called Scandal and it is selling quite well). The trouble began when I wrote about it in The Guardian, and they used a headline that included the phrase 'my gay ancestor'. I had not realised at the time how much a headline like that would irritate the doyens of identity politics. I mean, was he gay or not? If he was gay - as a number of people pointed out to me, rather forcibly - how could he have had children or great-great-grandchildren? Nobody wants to fall foul of the ferocious commentators who lurk below the line in the Guardian, but worse was to come. One man posted no less than eleven messages on Facebook explaining that he hated the book (though not actually why). That means I can't necessarily claim him as an irritated member of the identity politics brigade - but I have to assume he was. The one thing identity politics can't cope with is the idea of people being both/and... People who, as I am, feel European, and British, and English, and from Sussex, and from Steyning and from South London (born in North London). That is the essence of Liberalism, it seems to me - the acceptance of multiple identities. More than acceptance, in fact. It is embracing these different aspects - in the face of those who believe that men and women, gay and straight, French, Scots and English, can't possibly understand each other because we are too culturally conditioned. In the coming struggle between humanist and postmodernist, I know I'm on the human side (for my definitions of these terms, see my book The Age to Come). Now, I realise, I'm doing it again. My new medieval detective novel has a main character, a real character in fact, a wandering scholar known to history as Hilary the Englishman. Six of Hilary's poems still exist, three are love poems to nuns and three are love poems to young men. So whose side was he on? Was he gay or straight? Come on, David, don't sit on the bloody fence on this critical issue! Well, the answer is that he was both, and in that spirit, let me put two fingers up to identity politics and nationalism of all kinds by reproducing here my translation of Hilary's famous Latin poem 'To an English boy'. 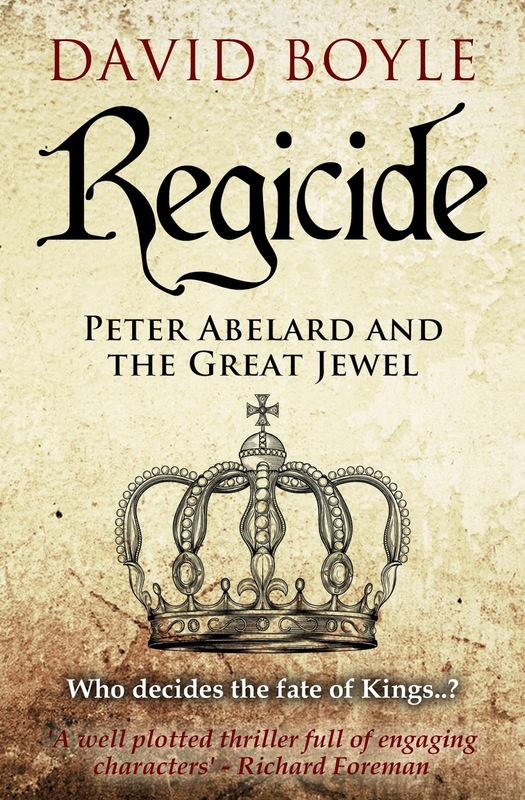 I might add, as an aside, that the Regicide ebook is on special offer at 99p until Tuesday, and there is also a paperback version. Who captures all who see behind your mask. Your conversation, but why make a list? Except your vow that you just won’t be kissed. You leapt out male to give us all some joy. She marvelled that she could such a creature make. She still had forced you to mortality take. With this unique son and nature’s heir. Within your flesh as white and light as air. Then Ganymede would hardly be his lover. Wine by day and kisses under cover. They sigh to hold your unrepeated flame. Change the vowel and use the ‘angel’ name. Apologies for my absence for the past week or so. This was partly because I've been away, but it was partly also because I've become so frustrated at the level of public debate about my chosen subject (the collapse of Southern Railways) - of which more in a moment. I find it staggering, even under the new government, how close the embrace has to be between government and operator if the market is dominated by semi-monopolies. That is the only explanation I can think of why the new rail minister remains silent, why the Transport Secretary blames GTR's failure to run its franchise to any kind of acceptable level on the unions - when their disruption (a pain in the neck too) is a drop in the ocean in comparison. (1) Serious and unaddressed staff shortages - they are about a quarter down in some depots just on the drivers they need to run their full timetable. (2) Inflexible new centralised arrangements for overtime which prevent depot managers from negotiating anything less than a full shift. (3) New and inexperienced staff at the control centre at Three Bridges. (4) GTR's failure to engender trust with frontline staff, despite their courageous loyalty during the recent three months of disruption - not helped by this persistent myth that the delays are due to some kind of industrial action. (5) A catastrophic collapse in morale among frontline staff and middle managers. To which you might add that these issues are not being addressed because of the debilitating myth that this is the result of industrial action, the so-called 'sicknote strike'. There is no evidence for this and it is frankly astonishing that Chris Grayling keeps peddling the myth at all. As I understand it, the sickness levels among frontline staff have now sunk back to pre-dispute levels, yet the disruption continues. They don't actually have the staff they need. Even today, I see that the Gatwick Express has cancelled a fifth of their services. Even more staggering, the Department of Transport - which originally agreed to a shortened timetable because of the levels of staff sickness - has agreed to extend it for four weeks, even though there is no more sickness than usual. I also understand - but could do with some confirmation of this if anyone reading this post knows more than I do - that GTR has decided to stop training their new on-board supervisors and have shifted them into a full training to be guards, which at least means they are thinking ahead. What is being done about all this? Well, thanks to the myth that this is due to industrial action, far too little. And what is being done is all short-term, emergency measures. I gather the new emergency timetable gives GTR the right to increase the number of hours their drivers will work per shift, without consultation. GTR managers are also being drafted in to drive trains. And as far as I know, they are still processing applications for voluntary redundancy to cut costs. None of these amounts to a solution. It also threatens to bring the drivers union Aslef into the dispute, which will allow the politicians to create even more of a smokescreen. In fact, both smack of the sort of desperate short-termism that characterises British governments at their very worst, as has done now for decades - short-termist, unimaginative, cravenly authoritarian. There is a whiff of the end of privatisation about all this. Not that we can go back to the old central control. It means there are now so few bidders for the franchises, and the relationships are so incestuous, and the control by Whitehall so tightly detailed, that none of the benefits of privatisation are possible - where is the breath of fresh air, the imagination, the customer focus, the investment, the competition? It is extraordinary that the ministers and the GTR managers are now locked into a mutually destructive relationship that means that they have to continue to remain silent, or to defend the indefensible. Something has to give. 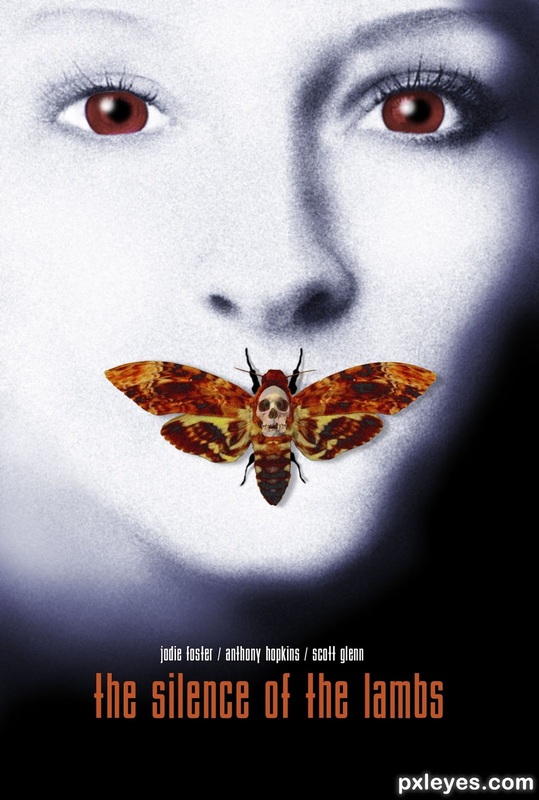 And the silence of the lambs, and Paul Maynard, continues. Twice in the last year or so, I’ve found myself having to intervene on the platforms of the London Underground to rescue older people from closing doors which were crushing them. On the second occasion, I was also shouted at for my pains by the platform staff for delaying the trains. 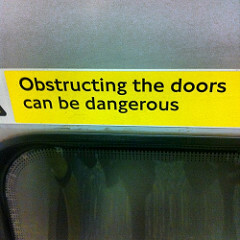 I hereby dedicate myself to obstructing the doors and causing delay where necessary. In fact, I dedicate this post to my friend Mike Harskin who first used the phrase (he hasn't been with us, I'm afraid, since August 1992). I draw no conclusions from this anecdote about the current rail dispute, except to say this: an effective and efficient railway is not going to be one without human beings. Railways without human input are efficient only by bending passengers to their will, like an assembly line. It isn’t civilised. But if this makes me sound as though I'm on the side of the RMT union, I am actually pretty cross with them. They seem to have snatched defeat (or at least compromise) from the jaws of victory by taking it out on their passengers for five days (yes, I know, the strike has been suspended) and providing the government and GTR managers with someone to blame for everything. Their boneheaded failure to campaign seems to me to have let down their own courageous and long-suffering staff (see my blog post ‘Lions Led By Donkeys’). As if on cue, I had a long letter from my local MP yesterday (Nick Herbert). He got most of his interpretations right and was right about the urgent need for rail investment in the south east. But he was so horribly wrong about the last few months – revealing that he has only really been talking to officials and GTR managers (the besetting fault of so many politicians). He still thinks the disruption has been caused over the last four months by unofficial industrial action, the mythical ‘sicknote strike’. There is no evidence for that and I challenge Nick to produce some. In fact, every absence by GTR staff since April has had to be covered by a doctor’s note. The rising sickness in May was linked to the extreme stress that the frontline staff were under, facing furious passengers, dangerous platforms and a dearth of information, day in day out. The failure to understand this is pretty fundamental. If the company had not blamed its staff, despite their huge loyalty and good humoured efforts to protect passengers, then there might have been enough trust to avoid the strike. GTR has a great deal to answer for, but then so do the politicians. Both have been motivated over recent years largely by a misplaced terror of the rail unions – thereby bringing about the very situation they feared. Most of the RMT activists I’ve met actually voted for Nick Herbert or this colleagues. They have been driven into the arms of an unimaginative, plodding union – which has given the government precisely the excuse they need to avoid facing reality. So what can be done? Well, I do give GTR managers credit. It was their inflexibility in the face of the April strike which kickstarted the present crisis. But their flexibility this time round may just save the day – and I pay tribute to them for that. They owed it to their staff, but it has taken guts to move as far as they have. 1. That the guards retain their normal safety role to signal to the driver, but the driver actually closes the doors. 2. That there should be unusual circumstances agreed by both sides (GTR has already agreed to this) whereby trains can be run with just a driver. 3. GTR to agree to put extra resources into the control room at Three Bridges and commit to always running the last timetabled service home (there’s got to be something in it for the passengers in this...). It sounds legalistic, and it is – but both sides can save face and we can get on with getting Southern running again. It is true that GTR is not as close as it needs to be to implementing their driver-only plans. Many of the Southern stations are still not licenced as safe by the Office of Rail and Road (the regulator) and the Department for Transport are said to be providing the resources to fight them about it. I don't know if this rumour is true - so perhaps anyone who knows could confirm or deny it. At the same time, the government urgently needs to look at the fundamental causes of this mess – a railway that doesn’t function which nobody can rely on, which is undermining the local economy and creating polluting traffic jams. A railway that is making people ill, staff and passengers alike. Once the RMT make this compromise, the government will have no excuse for failing to tackle the basic problem. I’ve talked about the failures of contracting culture (see my book Cancelled! ), and how little we want to strengthen Whitehall’s disastrously inflexible hold over the running of the railway – the whole GTR affair is a terrifying vision of what rail nationalisation would be like – but there is a problem. It is called monopoly and giantism. The two go together, as they say, like a horse and carriage. For the franchising system to work at all, there has to be enough potential companies to contract, and at the moment there are only a handful. The government will need to provide new entrants with the resources to bid and some of those new entrants need to be mutuals. People keep on asking my opinion what the fundamental solution is to the GTR/Go Ahead mess. It is that Southern Railways should be run by a mutual, owned by the staff. Like Waitrose or Welsh Water. GTR won’t like it. The RMT won’t like it (it complicates the class war). Both of these facts commend the solution to me. In fact, it seems to me that the frontline staff who have so courageously borne the brunt of the crisis deserve to be the owners of the company running the next franchise. going to allow them to be captured by the great nutcrackers - between the RMT and the Department of Transport - that grind everything very small indeed? RDW: Rest Day Working. This is the process whereby the company drums up enough staff to do the overtime they need to get a basic train service, when they no longer have the flexibility to negotiate a few hours here or there to fill in the gaps. My understanding is that the will of the middle managers to fill these gaps has now largely given out. GTR: Govia Thameslink Railway, the dysfunctional company that runs Southern, Gatwick Express and Thameslink, and which - despite serious staff shortages for the past two years - have failed to recruit the staff they need and are still processing voluntary redundancies. They are arguably the empty soulless cipher operating the tightest possible service agreement for the Department of Transport. It is their new inflexibilities that have prevented depot managers from cajolling staff into doing the overtime needed to run a basic service. 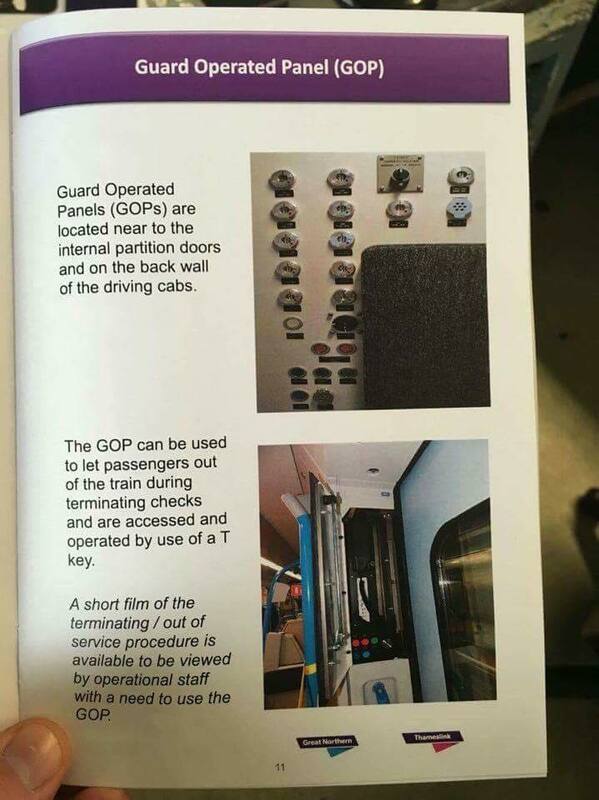 DOO: Driver Only Operation, the heart of the current dispute: GTR want to put guards in a customer service role on trains - without a guarantee that every train will have one - and give the responsibility to drivers to close doors and decide when to go, a responsibility they don't want. They say that the small CCTV cameras in the cabs are inadequate for safety on long trains and where there are no platform staff. DFT: The Department for Transport, the spider at the heart of this tangled web, which have contracted GTR so tightly that they appear to have no room for manoeuvre. They are responsible for starving the south of England of investment money (at least south of London Bridge), leading to the constant breakdowns, and limiting the rolling stock GTR can use, hour by hour. It is the DFT which is insisting on driver-only. OK, with me so far. Here are four widespread misunderstandings. Misunderstanding #1. The collapse of train services are a 'sicknote' dispute. There is no evidence for this at all. In fact, since April, GTR staff off sick have been required to provide a doctor's note for each day off. The small rise in sickness seems largely to be down to the extreme stress which staff have been under as the service unravels. Misunderstanding #2. The new GTR trains require drivers to operate the doors. That was what the company intended when they ordered the trains from Germany, but actually they have in the end been fitted with consoles for guards as well. So a compromise is possible. Misunderstanding #3. The dispute is about pay. In fact, guards are turning down a higher pay settlement to lose their safety role. The dispute is actually about safety - and the long-term role of human beings on trains (if any). Misunderstanding #4. The solution is to renationalise. This is Jeremy Corbyn's solution and is somewhat wrong-headed. Since this mess has largely been driven by the inflexibility of the Department for Transport, and helped along by the inflexibility of GTR, it makes no sense to give them even more control over the situation. I'm now off on holiday and am keeping my fingers crossed that the talks at ACAS can avoid a miserable crucifixion for GTR's courageous frontline staff on strike. I hope GTR and their paymasters can be big enough to pause the driver-only plan long enough for an independent review of it, especially about whether losing guards and platform staff together will break the Equality Act by preventing disabled people from using the trains - and there is some suspicion the appalling recent service may have already prevented them. "Firstly, thanks for your well written, balanced and informative blog. I have worked for Southern for just over [DELETED] years as a guard at [DELETED] depot. Until the last few months, I have enjoyed my job. In general, its pretty straightforward, interspersed with times of pressure and disruption. It's well paid, but highly unsocial hours with generally one day off a week for six to eight weeks, followed by a week of paid time off. In this way, the company balances our long days against our contracted hours over the course of the year. Our working week is Monday to Saturday, and we are "contractually required", to use the company's phraseology, to work on any Sunday we are rostered for, which amount to around 23 per year at my depot. It would seem that Dyan Crowther [GTR'S CHIEF OPERATING OFFICER] is unaware of our terms and conditions judging by the answers she gave at the recent [PARLIAMENTARY] committee hearing, saying we are only contracted Mon to Fri, and stating categorically that Southern was entirely at the mercy of the unions when trying to run a weekend service. This is simply untrue. As I said above, I generally and genuinely like my job, despite its repetitive nature and unsocial hours. My job satisfaction comes almost entirely from giving the passengers on my train the best service I can on any given journey. Often, its simply ensuring I speak to them with a smile, and get them where they need to be, when they expect to get there. Its about making constant judgements, who needs a bit more help, who looks a bit lost, who has obviously had a rotten day and just needs to be left alone, who travels every single day and does their commute on auto pilot (or asleep). When things start to go wrong, the nature of my job changes, and I monitor what's happening as best I can and try to give the passengers on my train the best info I can to get them on their way, what's running, what's not, where best to change or alternative routes, etc. The last few months, however, my job has changed dramatically, I cannot do a decent job, day to day, I'm unable to give those poor long suffering people a decent level of service, and I am left stressed, unhappy and demoralised." I hope GTR managers can now provide the support and loyalty to their staff that their staff have given in near impossible circumstances over the last three months. Some years ago, I made an unexpected splash in the media by suggesting that there were elements of the economy in the twelfth century which we might learn from, whether it was negative interest money, the just price or the guild system (actually a bit later). I was making no great secret of my admiration for the twelfth century and the dawn of gothic when, in England at least, the skeletons are as tall (and therefore as well fed) as they are now – and even taller for women. 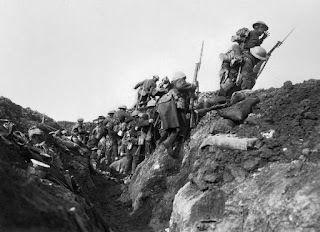 This was partly because I had been working on that period, and fostering an admiration for some of it – apart maybe for its dentists – when I was writing Blondel’s Song and after that when I was trying to bring the period alive in a fictional thriller. I needed a detective, or so I believed, to sort out the knotty question of who or what killed William Rufus, out hunting in the New Forest exactly 916 years ago yesterday. It struck me that – if I had been accused of murder back then, I knew exactly who I would want on my side. I would track down Peter Abelard, the greatest debater of the age and a good millennium ahead of his time in his existentialist morality. Yes, I would find Abelard and get him to defend me. So I read widely about Abelard, his life and his very famous tragedy, of course. It was while I was reading a particularly weighty tome nearly a decade ago that I discovered that he had a friend called Hilary the Englishman. Hilary was a poet, and six of his poems still exist – three love poems to nuns and three to young men. Immediately, a complete picture of Hilary sprung ready-made into my head, his own worst enemy, slightly overweight, a little put-upon. In short, I had found my Dr Watson. 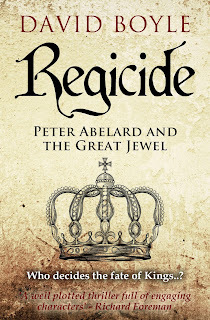 The result is my new book Regicide. I won’t bore you with the story of how I came to write the book about Hilary and Abelard (well, maybe another day), but just a mention will be enough of Hilary’s escape from death at the hands of a lynch mob, the King of France’s chancellor and a mysterious Man in Grey, that sends them to medieval Jerusalem (witnessing the foundation of the Templars) before returning to try to unmask the villain. I have no other motivation now than to suggest gently that, when you are on holiday this month coming, you might do worse than immersing yourself in the world of Peter Abelard and Hilary the Englishman, as they stand up against the forces of medieval chaos with only their wits to protect them. It is available for Kindle here and is now available as a paperback too. Have you noticed that 'Brexit' is becoming an excuse for every kind of incomp- etence and ineffic- iency? A sort of twenty-first century 'don't you know there's a war on?' I'm expecting Southern to start making announcements blaming Brexit for their continued failures. I mean, what else have they got to blame? But then, suddenly, they do have something else to blame. In fact, I am chewing my delay repayments with frustration. The mysterious but hopeless GTR, part of the absentee landlord system of rail franchising (I refer to the Go Ahead Group), seemed finally to be accepting reality. They have finally understood that they need to win back their staff, after enjoying the kind of relationship with them that Pavlov’s dogs had with Pavlov when they really got fed up with him. Senior managers have not just been meeting passengers and getting an earful from them on Victoria Station. But they have been very experimentally meeting their staff too – a meet the managers event went ahead last week at their Eastbourne depot. What’s more they have been discussing with the Department for Transport, to whom we are merely the playthings of the gods, about whether they can offer a proper payout as an apology to inconvenienced passengers and season ticket holders – and not before time. My strong impression, having been at the meet the managers event in Victoria, was that they had little more idea why the cancellations had been happening than anyone else (it's about inflexibilities in the overtime business, an recent redundancies, despite a huge staff shortage, but basically middle managers have given up). The past week has seen suicides, electrical fires and train breakdowns, just to keep the cancellation statistics up. Nobody apart from the Department, and a few local MPs, believe that this has anything to do with industrial action. In short, they had no leg left to stand on. They are committed, as most of the rail operating companies are, to the policy of what McKinsey called “sweating their assets”. This is now endemic in public services, a direct result of shifting costs to each other by meeting target numbers (but nothing else), and it represents a looming disaster. I’m not saying that they were about to do what passengers seem to want – commit to the safety role of guards and to human beings on platforms. I’m not saying that they were abandoning their ambition of a humming empty machine without human contact. But they had few other places to turn – especially with the prospect of a legal action for judicial review. Then what happens? The RMT decides to strike for five days in protest. When it is in trouble, GTR takes it out on the passengers and blames the union. Now the RMT has decided it will also take it out on the passengers and to blame the managers. In one fell swoop, GTR and the politicians have someone to blame again. Someone they can pass the buck to. In one fell swoop, all those people who have been prevented from getting home in time to see families will find themselves victims again. I don’t blame the guards, who have been on the front line of the current disaster, helping furious people day after day with superhuman patience and courage and humour. I do blame the RMT for their boneheaded failure to campaign¸ for their violent imagery (nobody needs this stuff about managers “kicking them in the face”), for their failure to understand that the world has moved beyond 1917 and the imagery of mass protest and the industrial proletariat on the march. I particularly blame them for their failure to see that, because of the way the GTR contract is structured, the company can only benefit financially from a strike. GTR is geared up for a strike; they have been planning for one. The only people who suffer are the passengers and frontline staff again. Talk about losing the moral high ground. Talk about losing the initiative. Talk about charging the guns. It seems to me to be another case of lions led by donkeys. It was their ridiculous fear of the RMT which led GTR managers to batter their staff (now I’m doing it!). It was their reasonable hurt at this which drove GTR staff into the arms of the union (most of those I’ve met actually vote Conservative). But I admit the flaw in my frustration. How are the guards to make their views felt? How are the passengers to claw back any kind of democratic control over how their taxes are spent? Or, don’t tell me, they have to evict the whole government to sort GTR and Go Ahead, as if that was any kind of democracy? Because if striking is the only legal option, then it is hardly surprising that they strike – even if it is like advancing across No Man’s Land. Those are the unanswered questions which lie behind this whole business. It is what happens when contracts lose their human scale, when everything is hammered out quietly between the well-paid gods of Whitehall and the staggeringly well-paid gods at Go Ahead. It is what happens when privatisation becomes state control again, with even less contact or concern for customers than ever. How do we have any say in the NHS when the decisions are taken in boardrooms in New York? How do we have any say in our children’s education when the decisions are taken by a carpet millionaire who gives teachers ten per cent off their carpets? No, incidentally, I don’t think the ultimate solution is to re-nationalise – the issue is scale and transparency not ownership. But who is listening? Or are we going to have to stay the playthings of the gods until the general election? I don't think the guards have much appetite for striking. They know they won't get rich that way (they know they are turning down an improved pay offer by doing so). But there is a solution possible - to agree to an independent review of driver-only. Why? Because of serious recent incidents when drivers couldn't hear screams for help. Because the new trains can be used either way. Because the combination of driver-only and removing platform staff almost certainly breaches the Equality Act, because it means disabled people can't use the trains. The Railnews columnist Alan Marshall will call for an independent review like this on Wednesday. I hope the company are listening and they will not put their staff through another strike after their extraordinary loyalty in recent months, in the most difficult conditions. I hope they can behave like human beings and stop this looming tragedy for everyone. Agree to a review. Soon.